For my day job, I blog at a local technology agency. I recently posted this blog on Core3 Solutions’ blog, but it’s also relevant in the handmade business. Not too long ago, I purchased sea monkeys to keep on my desk. Sea monkeys are tiny brine shrimp that are easily cared for. To me, they look like small feathers that continuously swim around in circles. I was rather excited when my sea monkeys arrived in the mail. They came in a small package, which must be put in purified water and are said to hatch immediately. However, after putting the eggs in the water – nothing happened. The Core3 gang and I stared at the water with disappointment. Where were my feather-like creatures? Well, as it turned out – that package was a dud. The sea monkeys never hatched. Luckily, the company offers a guarantee so I sent away for a new package of eggs. Though sea monkeys mean very little to most, this experience reiterated some valuable lessons. No matter how silly some may think my sea monkeys are, these lessons can be remembered throughout our daily routines as we work through various projects. I hoped to have swimming sea monkeys within minutes of putting the eggs in the tank. And when nothing happened, I was a bit disappointed. Setbacks can, and often do, happen as we work on projects. It’s important for people to adapt to the interruptions and work through them. Delays or glitches in projects can easily become stressful. However, if you see it as an opportunity to learn – it can be a great time to notice things you previously missed or even find a better solution than originally planned. If you continue to push forward and find solutions to problems, you can inspire those around you to do the same. In turn, your team will work together more effectively and will have the ability to proactively find solutions. 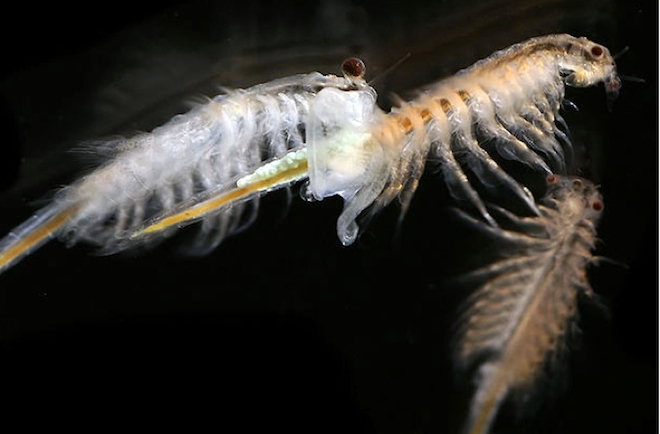 Though sea monkeys are relatively easy to maintain, they are tiny creatures that require specific care. When the sea monkeys didn’t hatch, I immediately thought that I had made a mistake so I went back to reread the directions. Luckily, I found that I had followed them exactly. However, it’s very easy to overlook a detail within directions or miss an important step within a project. Even on your busiest day, it’s important to slow down, read and fully understand the directions. If you make even a small error due to overlooking something your client requested, you could potentially lose their trust on larger aspects of a project. The details are important, no matter how many details there are to consider. Look at each step of the project and reread them as many times as necessary to ensure you have a full understanding of the project. Even when my coworkers chuckled a bit at my nonhatching sea monkeys, I didn’t give up. I read the instruction book and immediately sent away for replacement eggs. Now, my sea monkey tank is filled with full-grown, happy sea monkeys. This one may seem like common sense and it’s probably something you’ve heard time and time again. Never give up. But with busy work days and crammed schedules, it’s often easy to move on to the next thing on your to do list. Even if the people on your team are discouraged and want to give up, continue pushing forward until a project is a success. Work as the optimist and encourage those around you to continue trying even after a disappointment occurs. For the most part, I have a wonderful job that I enjoy. However, like with anyone – there are things that frustrate me or times that I simply need a break. With my sea monkeys swimming right above my screen, it’s easy to take a quick moment to watch them and enjoy a simple pause in my day. Sometimes work days can get stressful. There are frustrations within anyone’s workday. Allowing yourself a moment to sit calmly and not think about your daily annoyances can lessen stress, resulting in a happy and more productive day. Every day offers a new opportunity to learn. Find lessons in the things you do today and tomorrow you’ll be a better person because of it. Originally posted in Core3 Solutions’ blog. If you’re interested in digital marketing or web design for your company — check ‘em out!